What the crowd at midtown Manhattan’s Shop Studios this afternoon lacked in age, they more than made up for in enthusiasm. 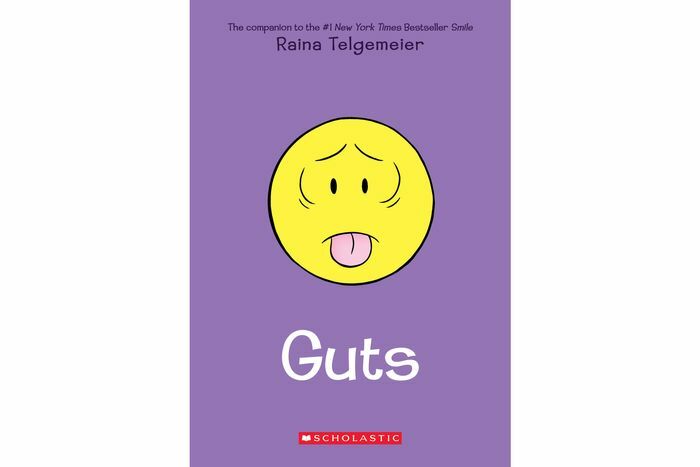 The teeming masses of grade schoolers had arrived with one mission: to worship at the feet of their hero, Raina Telgemeier. In less than a decade, the cartoonist has gone from being a virtual unknown to being one of the most successful creators in the entire comics industry — and she’s done it without the help of superheroes. 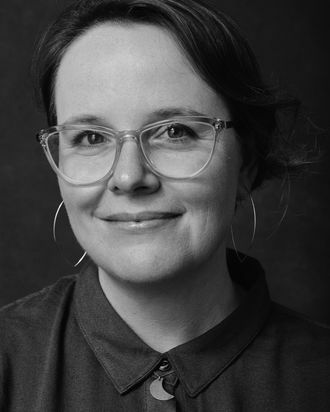 Her works are tenderly observed pieces of fiction and memoir about the trials of youth, whether it’s learning to confront mortality in Ghosts or dealing with braces in Smile. Telgemeier is the undisputed queen of the youth-comics explosion, selling books by the crate and touring the world to interact with her youthful fans. As part of New York Comic-Con 2018, she sat down with Vulture for a live conversation at Shop Studios where she answered questions from a crowd of astoundingly enthusiastic kids and did a live demonstration of her drawing process (she drew herself getting interviewed by Riesman, which will hopefully make his 11-year-old sister finally think he’s cool). But the biggest squeals of delight came when Riesman and Telgemeier announced the latter’s newest books, set to be released in 2019. 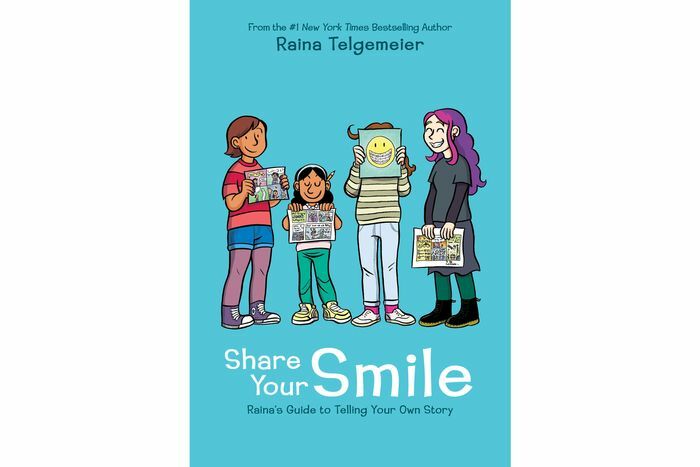 One is a how-to guide called Share Your Smile, scheduled for release on April 30; the other is a new graphic memoir called Guts, slated for sometime in September. A few days before the live event, Riesman caught up with Telgemeier over the phone to talk about the books and where her career is at these days. Check out that conversation below. So! What’ve you got coming up? I’ll start with Share Your Smile, which is kind of a how-to-journal book. It’ll have writing prompts and journal prompts and ways to build stories, and a little bit of insight into my own comic speaking process. And then Guts is a memoir in the vein of Smile and Sisters. It takes place before Smile. It’s the true story of my struggle with anxiety as a young person. In fourth and fifth grades, I developed a bit of an anxiety disorder and started having panic attacks and phobia, specifically regarding food and stomachaches and bodily functions. So the story walks you through that experience and tries to get inside what it’s like to have a panic attack. It sees young Raina through therapy, which was a bit of a taboo subject at the time. It feels to me like a bit of a prequel to Smile. The inner workings of young Raina’s head before she was in middle school. Along those lines, what are the challenges of getting into young Raina’s head? You’ve done it a few times now, but what are the hardest parts about doing it? Guts is going to go back a little further in time than some of my other books, so those memories are a little bit hazier. I have all of the broad strokes and have been thinking about those broad strokes for a little bit more time. There’s a little bit more writing involved and imagining all of the linking pieces of the story. A lot of that is helped by talking with friends, talking with family, talking with people who were there at the time. I actually spoke with an old teacher of mine briefly to channel some specific details of the story. Whoa, what was that like? It was great. It was a very short Facebook interaction. The teacher had heard my name in the context of hearing about my books, hearing about my success, so he reached out and said, “Hey, I’m really proud of you, I’m really proud to see that you’ve had such a great run, and I really saw your talent as a young child.” And then I said, “Hey, can I pick your brain for a second?” [Laughs.] I just wanted to remember the name of an activity that we used to do in class. I had it right, but I wanted to confirm it with him, and he confirmed it, so that was cool. Also, looking at family photographs, for me, is always a great way to channel those old memories. I also, in the last couple of years, have been given by my parents several boxes of artwork and writing assignments and homework and things from my elementary-school years. So I’ve been able to dig through those and those memories as well. Do you find it painful to cast your mind back in time like that? It’s more that it connects who I was then to who I am now. I’m still somebody who deals with anxiety, so it’s almost like therapy. It’s sort of like a form of exposure therapy, where you’re really facing the things you’ve dealt with, and the things I’m still dealing with, and connecting those two things and trying to make some sort of sense of them. For me, this is always a helpful exercise. Just like writing Smile was a good way of dealing with trauma from my past, I’ve found that woking on Guts has also been a very cathartic and rewarding experience. Tell me about the origins of Share Your Smile. I get a lot of correspondence from kids telling me, “Can you give me tips on how to make comics?” I’ve done workshops, I’ve done school visits, I’ve done a lot of work with kids where I’ve spent maybe an hour guiding them how to tell a story. That’s never enough. An hour is great, but most of these storytellers would like more in-depth, hands-on guidance. Because I can’t give that to every single kid in America — or the world, I guess — doing a journal is a great way to share some of my knowledge and some of my technique and give them ideas. Hopefully, it’ll inspire kids to create comics about their own lives. Did you consult any of the classic works about how to make comics? Will Eisner, Scott McCloud, any of that? Not really. We’re going for a younger audience than any of those books are used for. This isn’t a comprehensive how-to-make-comics book. This is more about how I tell stories and giving some of those ideas to younger writers who are interested in trying it for themselves. I was a kid that made comics without any guidance. I read them and then I started making them. That’s all I had to go on. I know for sure there are plenty of young budding cartoonists out there who are doing the same thing. They’re reading a lot of graphic novels these days and they really like what they see. Because waiting for new books to come out takes so long, they’re sometimes filling that gap with this new desire to tell, read, and share stories. So, I’m hoping that this will give them another tool for their tool box. It’s going to have some behind-the-scenes insight into Smile and how I write autobiography, and that means there are old photographs and there are sketches and you can see my process from my beginning state all the way to the end. Speaking of process: You’ve been at this comics game a while now — how, if at all, has your process changed between when you did Smile and Guts? Do you worry that that sort of dilutes the creative process, to have those conversations? In this case, I wanted to make sure that kids reading about my experience with psychotherapy wasn’t going to be misinformative. Because there’s a therapist character, I just wrote from my memories. I’m not a psychologist, I’m not a therapist, I don’t have the training that they would, so it was really helpful to have somebody who was a professional to help me craft her exact wording in certain things. Had you always intended to go back to your own life for an inspiration to another book or was that kind of a surprise to you? ﻿I’ve been writing personal stories for so many years. It predates Smile by decades. I’ve been writing journal comics and personal-narrative stories for almost as long as I’ve been alive, so this never feels unnatural for me. This story had a slightly different shape at the beginning of this process. It grew and it shifted and it became what it was about a year and a half ago. Once it locked into place, it felt like it had always been there. I know I’m onto something good when it’s a story I’ve thought about a lot anyway. It’s a story that has always existed, it’s a story that I’ve always told people, but I haven’t figured out how to put it into a book format until that moment. Then that moment arrives and it feels like, How did this not exist until right now? So that’s how Guts feels. It feels like it’s always been there. I’m relieved, I’m delighted, I’m so glad I get to share it with my readers. I imagine a lot of your young readers have treated you like a therapist over the years when they get to meet you. ﻿Definitely, when I get to do appearances. My favorite part of the onstage events is the Q&A. I encourage the kids to not hold back. I tend to get pretty real and don’t pull punches when I’m answering questions. It’s a really vulnerable experience. I’ve cried on stage, I’ve had to take breathers sometimes. But I always walk away feeling energized and I just appreciate my readers and how much of themselves they are willing to put out there by asking these questions. Questions can range from advice about friends to advice about braces to sharing family anecdotes to sharing really deep things about themselves and their fears and their dreams, and it’s wonderful. I love seeing these young minds coming into themselves. It really helps me, too. It’s for them, but it’s also very much for me, and I love it. I know with this book there may be questions that come up that I’m not, as of yet, ready to answer. But we still have a year until the book releases, so I’ve got time to get ready. Anything else readers should know about the books? Just know that I’m really excited. I’m excited about having two books out in 2019 and I can’t wait to get on the road to share these books with people and meet people and to talk to people. I can’t wait to talk to my readers. I’m so grateful that my books get to open up conversations, not just between me and my readers, but between my readers and their friends and their families and really themselves. So I’m looking forward to doing it all over again.